It’s not often I am completely thrown by Burda directions. But, I couldn’t understand the placket directions for the life of me. Luckily, I was able to call DVMCindy in California. For some crazy wonderful reason, she had written all of the notes and directions out for this pattern and walked me through construction on the phone. Awesome. This makes FIVE patterns I’ve sewn from the January 2008 Burda Magazine. Five! That’s a record for me. 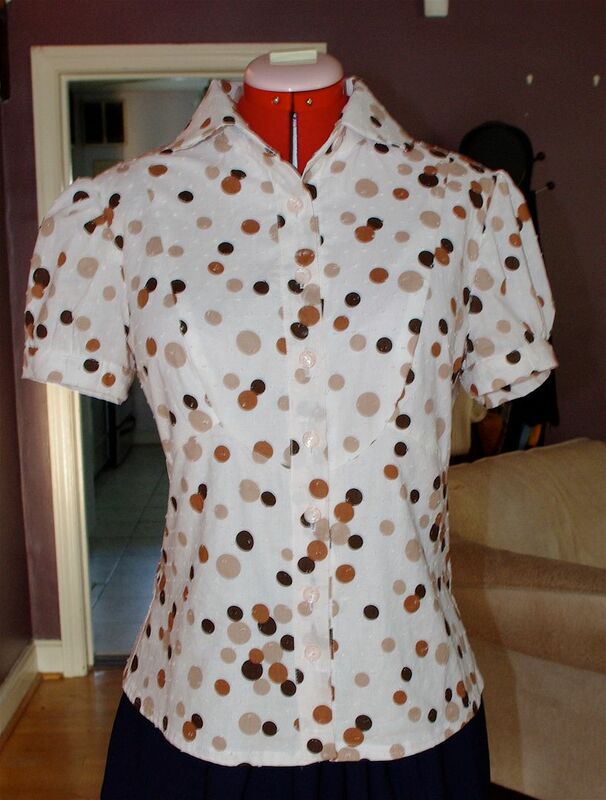 This swiss dot with brown polka dots was a pleasure to work with. And, I just love the polka dots! It’s so fun and youthful! 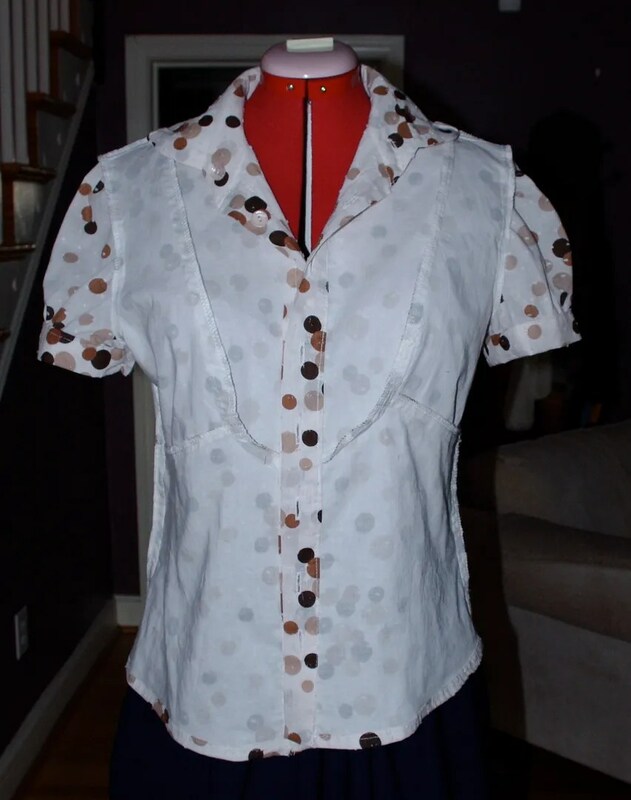 I used hand basting to underline the blouse with cotton batiste. Both the batiste and swiss dot were purchased in NYC. I did not do French seams as many other sewists did. Why not? Because I don’t know how to do them. I know they are easy, but I’m not inspired to learn just yet. Besides, with the underlining, you couldn’t see through and my serger served me quite well. I didn’t alter the sleeve for the bicep. But, I did sew the sleeve band with a 1/2 inch vs 5/8 inch sleeve allowance. It’s a touch snug. But, I can live with it. I did make a 1/2 inch FBA using the Princess Seam Method from Fast Fit. The buttons are light pink from my ages old Fabric Mart $5 bundle. The skirt is part of my China capsule. It’s the April 2002 BWOF pattern I made a few weeks ago. This photo was taken after several hours of sitting at my desk. The linen wears very very well. Overall, the blouse is a terrific pattern. I love it. But, I think it’s slightly too big on me. I recently started sewing a 40 instead of a 38 with a FBA. But, I think I should stick with the 38, make a FBA, a swayback adjustment and increase the hip width. The nice thing about it being slightly loose is that it will be that much cooler in China. I’ll likely wear it untucked while traveling. But, tucked in like above for work. This blouse also provides enough ease that I can cross my arms without feeling like I’m in a straight jacket. In my last post I said I was done with my East Coast to Far East China capsule, but I lied. I’m trying to sew one more dress (I leave in just less than two weeks). I thought I could use something a touch more professional for the meetings I have to go to. It’s all cut out, lining too. Let’s see what I can get done this weekend! 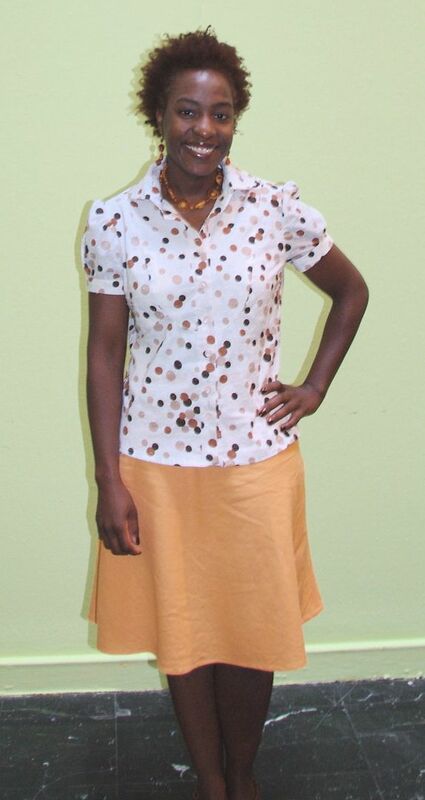 Very cute blouse, fun fabric and I agree very youthful. SO cute! Love the polka dots and design. I wish I had this issue!!! SWEET! Nicely done Cidell and DVMCindy! What a great top! And it works so well with the orange skirt. Great addition to the China wardrobe. Can’t believe it’s less than 2 weeks away…so are you excited!?! Great top! I love the polka dots! Gosh it looks nice tucked in. The tuxedo blouse works for all shapes and sizes doesn’t it. It looks like it fits GREAT in the pictures. I too love it tucked in with your orange skirt! The shape/design of this blouse is very flattering on your figure. I love the fun dotty fabric you used, too! Oh I love it! This is such a pretty blouse. I really like your fabric. It looks like the perfect marriage of fabric and pattern. It looks so nice, both inside and out! Beautiful! I am a sucker for Swiss dot. You look great! 5 patterns from one issue, wow. Great look – great blouse. I love it all tucked into the skirt! Fabulous! Great fabric & pattern matching, great fit (if it feels too loose, it looks perfect). Oh! Oh! Oh! With the blouse tucked into that orange skirt it is SUCH an Emma Pillsbury outfit, and it looks fan-freaking-tastic! So lovely! 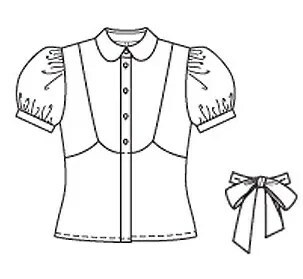 I HAVE to make this blouse too now. Any chance you could do a post on how to get past the confusing placket instructions? The shirt is adorable! The third picture from the bottom is an especially great shot of you. Nice blouse! I don’t think it’s too big at all; it fits your figure nicely. Don’t feel bad about serging vs. French seams–it looks fine and French seams might have been too much with the underlining. Again, nice blouse. It looks very nice on you. Adorable! But in a grown-up way. Both pieces are very flattering on you! Gorgeous blouse! The dots are very now, and it looks so ladylike tucked into the skirt. Very nice blouse! It looks great on you. Love the skirt, too! Cutest blouse ever! Don’t change the size — it looks perfectly fitted! I love both pieces on you. You look great! That peachy-orange is a great color on you! Nice work on the blouse and skirt. It came out so cute!!! 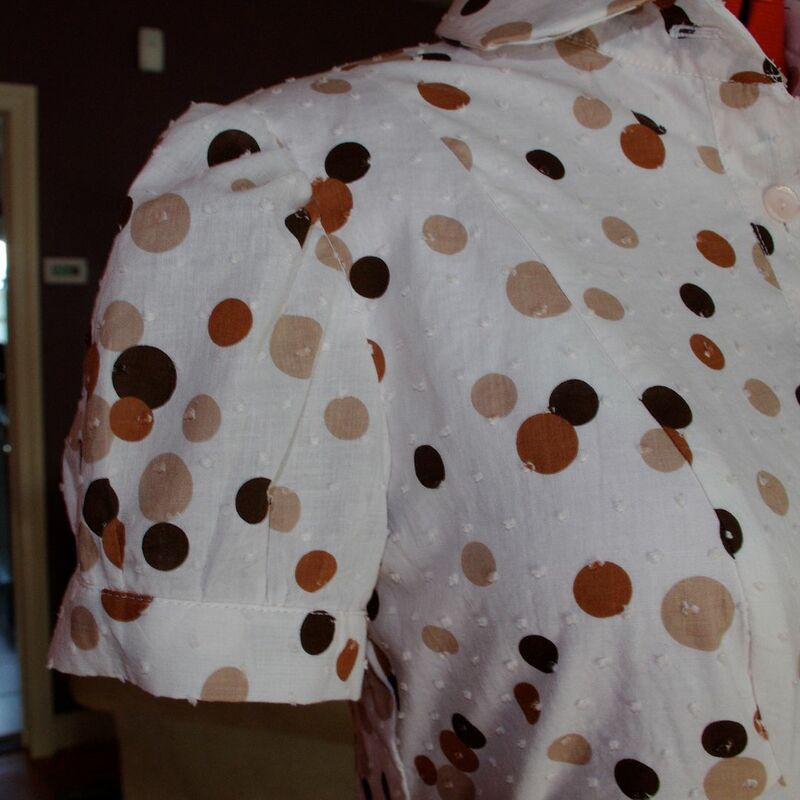 Love the polka dots and swiss dots and it will be fantastic for the hot weather in China. I love that entire outfit on you! It’s really pretty with the orange skirt. You look so pretty in this combination. I love both the blouse and skirt, very cute! This turned out really cute. I love how you have styled it for work. The colors look really good together. This blouse is SOOOOOO cute. I love it. Great job. I love the blouse (especially that print!) and the La Mia skirt from a previous post. I agree, the La Mia skirt will look fab in a drapey wool with boots! Perfect! I love the fit and cut of this on you. Great out or in. The blouse is super cute and really, really suits you. What an awesome job!! Cute cute cute! I love that it goes from being tucked in to untucked so seamlessly. I think a lot of blouses look best one way or the other, but not both. Great addition to the wardrobe capsule. I hope that it’s okay to comment on old posts. I really like this shirt and the nice touches. Now off the read the next post to find out whether you finished another dress before going to China.